After taking Charlotte to the dentist last week, I was so exhausted by the trauma that I had to lie down after lunch. I felt like I had been through the wringer in the 1.5 hours spent in the torture chamber dentist's office, so I skipped my work out, instead opting for relaxing on the couch watching "Veronica Mars" on netflix. I'm sure you'll agree after reading this harrowing account that I had earned the rest. After Char's cleaning, which was entirely uneventful, we were informed that she had some cavities that needed filling. I was horrified. How could I let my child's teeth rot like that? How could I, her mother, let Charlotte down so woefully? I sat there and mentally cataloged every morsel of candy I let pass her lips, every time we forgot to brush. I beat myself up over the cavities and worried and agonized while waiting for the dentist to get done with a root canal so she could take care of Charlotte. During the interminable wait, I considered all the things that could go wrong. I was sure the kid would panic and flail as soon as she heard the drill. I worried that she would start crying but that it would be too late to stop, that we would have to hold her down while the dentist finished the torture drilling. Tears filled my eyes as I considered how traumatic this was going to be for my sweet little girl. I even felt a bit nauseated and light headed especially when I saw the drill boring a hole in her tiny little teeth. I clung to her hands waiting for her to stiffen with fear and pain. Anytime Charlotte shifted in her seat or moved her hands to her face, I just knew she must be experiencing intense agony, the likes of which would be sure to be the cause of a lifelong fear of dentists. She would turn into one of those lunatics who couldn't bear to visit the dentist. You know those people who are totally phobic about going to the dentists, the ones who tense up the entire time someone is working in their mouth, even when the hygienist is just squirting flouride on their teeth. People who have so much anxiety their fingers can barely straighten out after having clung tightly to the arm rest during the whole procedure, even though it was just a cleaning. Those crazies who break out in a cold sweat at the mere mention of a root canal or the smell of a dental office (because really, we all know that ominous smell, don't we?). The ones whose bile rises in their throat when they hear a drill. The people who would rather endure labor pains than have a tooth drilled for a crown. Yes, I obviously have some serious dental issues. After the ordeal, Charlotte got to pick out a toy from the basket, after which I hobbled to the car. Charlotte chatted chirpily about something, but I couldn't focus on her words. I felt weak and dizzy and needed to concentrate on getting to the car. Wiping the sweat from my brow, I buckled Charlotte into her booster seat and breathed my first deep breath in hours. Strangely, I discovered that all my muscles in my neck, shoulders, and hands were completely tight and knotted up. Once on the road home, I decided to ask Charlotte some questions, to make sure she was OK. I wanted to reassure her, to let her know how sorry I was for the trauma I had subjected her to. I had to let her know that I would do everything in my power so that she would never have to live through another dental visit like that one. So, I asked her, "Charlotte, how are you feeling, honey?" "Fine, mom. Hey, did you see what I got from the toy basket?" she replied. "Yes," I said, "It looks like a nice ball. Hey, when the dentist was working on you, did it hurt?" "What did you think of the dental visit, sweetie?" I asked. "It was fine. Hey, mom, did you see what the dentist gave me? I got a princess toothbrush!" "Yeah, that's nice, Charlotte. From now on, we are going to have to be much more diligent about brushing in the morning, not just at night. And we'll have to cut down on the candy!" "Because you had some cavities and we don't want to have to come back to the dentist too soon, do we?" "But, mommy, I LIKED the dentist! It was so much fun! When can we come back again?" I'm thinking I should have grabbed that laughing gas mask and administered some to myself. Is it horrible that I now wish my daughter could get my root canal done for me next week, since going to the dentist is like a play date with Barney for her, whereas for me it is tantamount to waterboarding? "Advise me at your own peril." "Warning: Any more advice may make my head explode! Most parents receive lots of advice from other people. 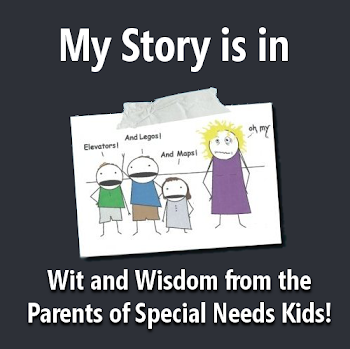 Parents of kids with special needs, however, often feel completely flooded with all the suggestions professionals, doctors, teachers, family members, and friends provide on an almost constant basis. Our Journey Thru Autism is hosting a contest this week and giving away a copy of Coloring Outside Autism's Lines: 50+ Activities: 50+ Activities, Adventures, and Celebrations for Families with Children with Autism by Susan Walton. I read this book and reviewed it for OJTA. You can read the review here, but if you don't have time to read it, let me tell you that I love this book. Really, really love it. As I told my husband, sometimes I come away from an autism/SPD book feeling discouraged about what I am not getting done with my kids. Walton's book is totally the opposite. She encourages having fun and adventure with our kids, and her writing was inspirational to me rather than guilt-inducing. 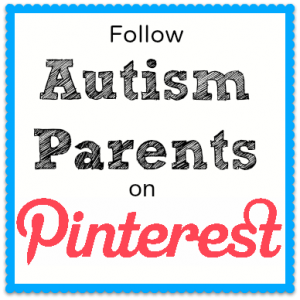 So, head on over to Our Journey Thru Autism to enter the giveaway. All the details are here. I never ran for Student Council in high school, was never entered in the Homecoming Court, and definitely never entered a beauty contest, so I have never had the opportunity to solicit votes for myself. 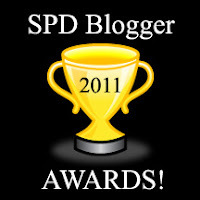 Surprisingly, I was nominated on Hartley's SPD Blog Awards! This is a big honor, especially in light of the other bloggers who were nominated, who are incredible. To be honest, I was half tempted to get my husband to nominate me, but thought that was just a touch too sad. I mean, after all, he's my husband so he has to say he likes my blog. Imagine my glee when I discovered that I had indeed been nominated, and not by the person to whom I am married, and who is therefore forced to do what I say. Due to my aforementioned lack of experience, I have no idea what I should do to convince people to vote for me. Do I make buttons and bumper stickers? 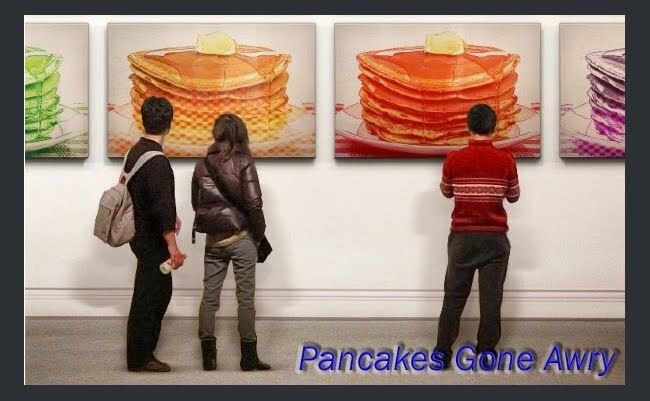 Plaster the lockers with posters of pancakes oozing syrup? Make a bunch of campaign promises I never intend to keep? Kiss some babies and shake some hands? I'd love it if you voted for me! ***This ad was paid for by Citizens for Pancakes. Danny's autism manifests itself in many ways; he has major sensory issues, tends to be extremely literal and the term "inflexible" seems like an understatement at times. Though those issues are overwhelming and disturbing at times, it is Danny's immature social skills that bother me the most. For at least the last year I have been mulling over how I could best teach Danny good social skills. It's a lot trickier than I initially thought it would be. I mean, how do you teach someone skills that typically come so naturally to most people? And more importantly, how do you teach them in a meaningful way so that the child actually learns how to apply them? Last January, when Danny was initially diagnosed with high-functioning autism, I learned about a social skills group in a town 35 miles away. I was thrilled. Finally, a group overseen by a professional trained in working with kids with autism. I thought my prayers had been answered. Unfortunately, that was not the case. We attended the group for about three months, but in that time, Danny learned very little about social skills. He enjoyed the group meetings, but mostly because they had some cool Legos that we didn't have at home. The group leader spent most of the time on very rudimentary skills, such as identifying different facial expressions and emotions. While that seems like it could be a great starting point, as far as I could tell, it never went very far beyond that. I know that these are definitely skills that many children with autism need help with, but Danny doesn't need much help in reading facial expressions. We've been working on that for years, and he has a fairly strong grasp of the concept. What he needs help with is knowing how to appropriately respond to those facial expressions. He needs to learn how to use his words when working with others. He needs practice in reaching out to kids and keeping a conversation going, among many other things. Basically, it seems to me he needs help with slightly higher level social skills. Unfortunately, those are not the kind of skills he can learn from a book or from looking at magazine pictures. No, for these skills he needs hands-on experience. After taking a break from the ineffectual social skills group, we tried a club in our town for kids with autism. Adventure Club was terrific in that it provided lots of opportunities for learning and fun. Danny did get some socialization and learned a bit about working with others in this group even though that was not the focus. But, now that summer is over and the founder of the group has moved to another state, we are basically back to square one. I have debated starting my own social skills group, perhaps one built around Lego building since that is Danny's passion, but many issues have held me back. I don't know if I am up to making such a big commitment. I am not at all confident that I would even know how to organize such a group and I am afraid I would get totally overwhelmed. I have so many other things on my plate that adding to it the responsibility to teach social skills to my (and other people's) kid(s) just doesn't sound like something I can wrap my brain around at this point. After much internal debate, I think I have arrived upon a solution that could work for all of us. I think a regular social skills group is not the right fit for Danny at this time. Instead, we have decided to enroll him in the local Cub Scouts chapter. He would be interacting with kids his age on structured activities that are fun. Plus, since he is only 7, a parent needs to be there with him. So, one of us would be there to help guide Danny and remind him of proper social behavior. On top of that, we could see firsthand which skills he is most lacking in and could work on those at home. I know Cub Scouts won't necessarily be a silver bullet for all of Danny's social skills needs, but I do think this is a perfect opportunity for him to practice the skills he does have and acquire some new ones, while having some fun. Check out Help! SOS for Parents for more links to posts about social skills. I'm over at Hartley's today posting about how to know when to brave that sensory crazy place they call the world, and when to refuse invitations. Check me out here if you get the chance. Last night, as I lay awake staring at the ceiling, I realized that it has been exactly a year since Danny was diagnosed with high functioning autism. I am surprised at how quickly the time has passed, since hearing the diagnosis made me feel like the world was ending. I remember how it felt like being punched in the stomach when the doctor said that no, Danny did not have PDD-NOS, but rather autism. Autism. The word I had been dreading. My sister came with me for that diagnosis and she held my hand and vainly tried to hold back her tears. She wasn't surprised by the verdict--I don't think anyone really was--but that didn't make it any easier for either of us to swallow. I felt strangely defensive and protective of Danny. All I wanted to do was put my arms around him (though he probably wouldn't have let me) and shield him from the cold, hard, dismal place that the world had suddenly become. Though I am sure he had no idea what the doctor was talking about, I wanted to make things all better for him. I wanted to give him treats and shower him with love. Instead, we took him to Subway for lunch, where Danny gleefully pronounced to my sister that he loved pickles. The worker making our sandwiches must have heard him, because as I was paying, she said to me with a smile on her face, "I added some extra pickles to your son's sandwich, because I heard that he liked them." Though my sister had to fight back the tears in the doctor's office, I had been strangely calm and composed. But when that worker performed that tiny act of kindness for my son, I could barely stop myself from bursting into tears. I'm sure she wondered why I thanked her so sincerely. What she didn't know, though, was that somehow, she had given me a small gift, a little bit of hope to cling to, that maybe, just maybe there will be other people in this world who will treat my son with kindness. That not everyone out there is cruel to those who don't necessarily fit in. That maybe things would be okay. I don't exactly know why, but I still tear up at the memory. Maybe it was just that after all the clinical autism-speak by the doctor, it gave me comfort to have Danny treated like a little boy, rather than just a diagnosis, a statistic. To this day, I appreciate the people who are kind to my boy, the ones who see him as he really his, the ones who truly accept him. I cherish the times when a child or adult says something nice about him or when they reach out to him. And I am still surprised when these acts occur, even though they happen pretty regularly. It's not that I think Danny is unlikable; I know he is charming and funny and delightful. Still, I also know from experience that the world is populated with people who mock differences. People who are mean to those who don't fit the world's definition of "normal." And I am terrified of the day when someone like that hurts my little boy's feelings. I am hoping that the majority of people he comes in contact with are like that Subway worker, people who are regularly kind to everyone, no matter how different they may be. And I suppose I will need to let go a bit more; no parent can shield her child from every pain or disappointment, no matter how much she would like to. After all, what this past year--the Year of the Diagnosis--has taught me is that Danny's pretty tough. He regularly stands up for other kids with no worry of how he will be treated. He's passionate about seeing justice served and is much more resilient than I give him credit for. So the world didn't stop for me or for Danny that sunny January afternoon last year. In fact, it was only just beginning.